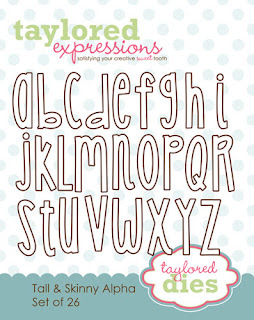 HandKrafted by Stephanie: Taylored Expressions August Previews Day 1! Taylored Expressions August Previews Day 1! Hello! Happy Tuesday! 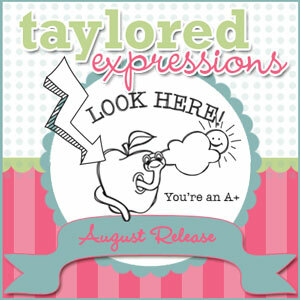 Welcome to Day 1 of Taylored Expressions August Previews! Today we are previewing ALL of the new stamps that will be released on Thursday, August 9th @ 8:00 AM PST in the TE Store! We will be having a Preview Party tomorrow evening at 6:00 PM PST. 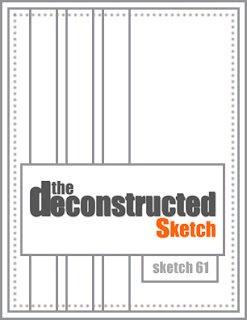 This will be your chance to see full sets and there will be lots of prize drawings. The party is always fun and fast-paced! Be sure to join along HERE! Today I am peeking Happy Trails, a new full-sized set that was concepted by Jami Sibley and illustrated by Doug Applegate! This set is all about camping in style - old style - with the retro Air Stream Trailer, Tear Drop Trailer and so much more! What a fun way to close out the Summer! First I made a card using the largest trailer. It made me think of camping with my SIL and BIL, though their trailer is far from retro! 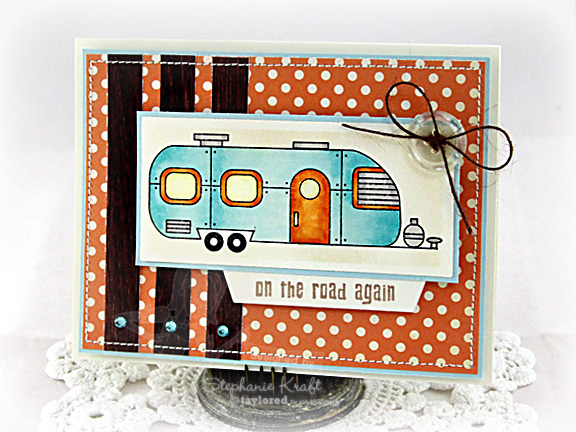 I stamped and colored the trailer - I bet you haven't ever seen a trailer with these colors! I added my sentiment on the flap (intended to be tucked in) from the new Library Pocket Die. My patterned papers are from the October Afternoon 9 to 5 collection. I used Jen's Deconstructed Sketch 61 for my layout. My title is a combination of letter stickers from my stash and "hike" was made from the Tall & Skinny Alpha Dies. 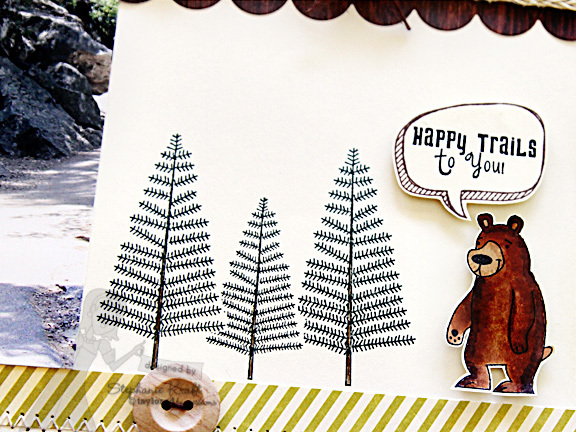 The pine trees, bear and "Happy Trails" sentiment are all from Happy Trails. 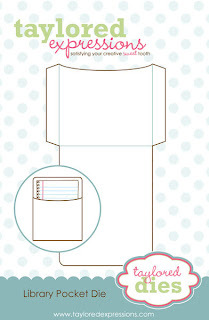 The speech bubble is from another new TE set that is being released this month, Doodle Notes. I stamped the sign and added "Happy Camper" (also from Happy Trails), colored with Copic markers, fussy cut and popped it on my layout with foam tape. Thanks so much for stopping by! I'll be back tomorrow with more previews! Accessories: Library Pocket Die (Taylored Expressions), Long Rectangle Nestabilities (Spellbinders), Markers (Copic), Button, Brown Burlap Twine (May Arts), Rhinestones, Foam tape, Thread, Sewing machine. 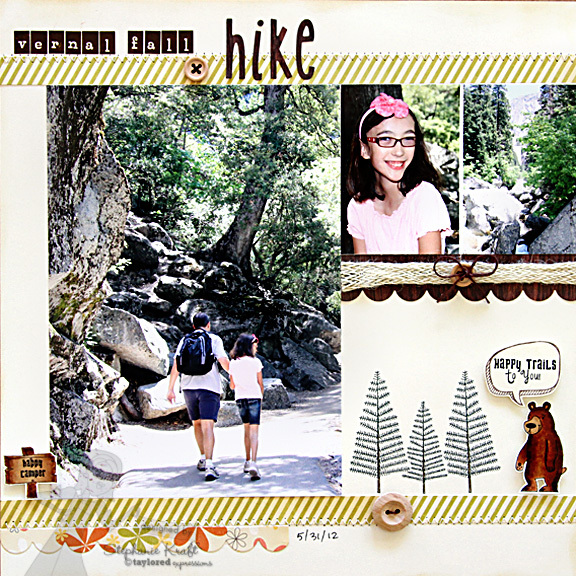 Accessories: Medium Scallop Border Die, Tall & SkinnyAlpha Dies (Taylored Expressions); Markers (Copic), Wooden buttons (Maya Road), Burlap Ribbon, Brown Burlap Twine (May Arts); Letter stickers from stash, Foam tape, Thread, Sewing machine. wow gorgeous scrap layout, love your card too...what a cool new stamp set! I love the projects!!! Great job! So adorable, Stephanie! I love your card and your page is just fabulous! What wonderful memories! 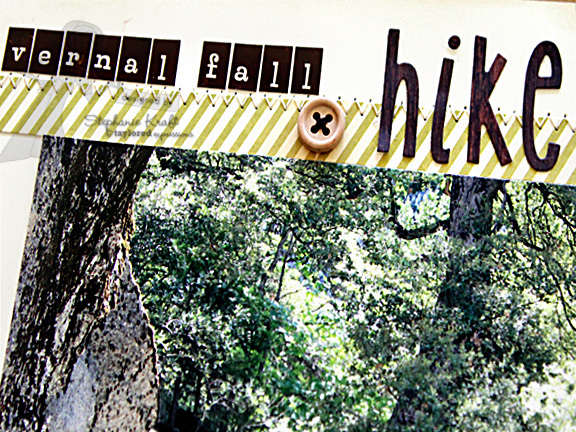 Love your projects, especially the the scrapbook page! These are amazing Stephanie! Your layout is fabulous. 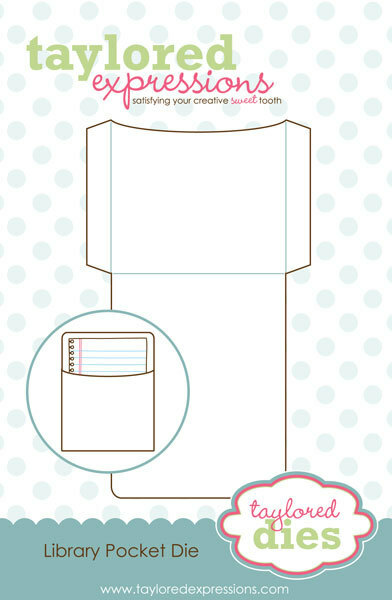 LOVE the way you used the designer paper! So fun! Hi Stephanie! SUPER cute projects today! 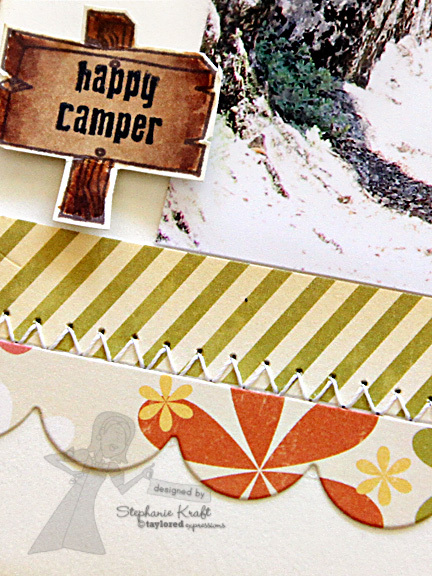 Love that little trailer and your scrapbook pages are wonderful. I've hiked the Mist Trail many times...brought back good memories! Terrific projects Stephanie! Great hiking photos! Looks your trip was a lot of fun! Very cute stamps! Love the card and layout. Love your card and layout, your coloring on the trailer is gorgeous!